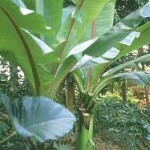 Ethiopian farmers have been planting enset bananas for nearly 10,000 years. Today, it provides food for about 15 million people mainly in the south and southwest of Ethiopia. One enset plant produces about 35 kilos of food, and the areas where enset is cultivated support a much higher population density than in areas of cereal production. A small farm of 2,500 square meters can provide a family of 6 people with food for a year. Edible starch is extracted from the corm and pseudostem and fermented to make “kocho”, an important food for millions in Ethiopia. The kocho can be stored without spoilage for up to 10 years, providing a unique insurance system and food security for poor subsistence farmers in times of drought. Enset is a very drought resistance an ideal crop for a changing climate brought about by global warming, where the weather pattern is abnormal. That is why the areas where it is cultivated have never suffered from famine, even in extreme drought and rain failure. Enset can be grown without the use of pesticides. It helps prevent erosion, preserve soil moisture through its perennial canopy of leaves and provides partial shade for inter crops such as coffee. Aside from its being source of food for people and livestock, enset is also a source of fiber for making ropes and twine, shopping bags, handbags, suitcases, burlap, sieve and mats. 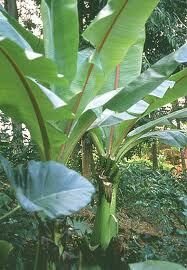 These plants which have been introduced outside Ethiopia, used enset as ornamental plants.